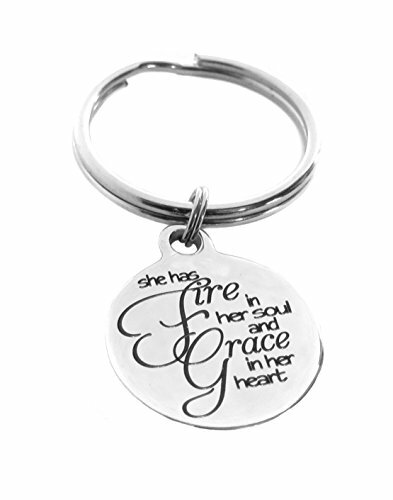 This inspirational Keychain is made with a Stainless Steel 3/4" x 7/8" or 19mm x 22mm circle charm that says, "She Has Fire in Her Soul and Grace in Her Heart" circle charm. Makes a great inspirational gift! Features a stainless steel 3/4" x 7/8" or 19mm x 22mm circle message charm. Wonderful gift for any high school or college graduate! Also those facing a change in employment, a new business venture, retirement, an addiction recovery, divorce, break up or virtually any other life change, challenge or commitment to a new beginning!